Trisha Murphy of Sullivan says she'd just been hit with a $700 bill after her car was towed, when the customer told her he would be Santa. A single mother from Sullivan received an early visit from Santa when a stranger left behind a $500 tip. This is the Denny’s receipt that Trisha Murphy rung up for a generous customer. 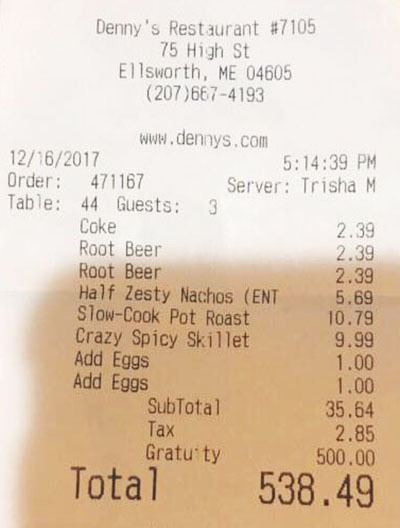 Trisha Murphy, who is raising four school-age children in the Hancock County town, told WCSH-TV she was waiting tables at the Denny’s restaurant in Ellsworth on Saturday when three men who looked “a little grungy” sat down in her section. Murphy wrote on her Facebook page that she was feeling stressed because she hadn’t finished Christmas shopping and had just been hit with a $735 bill after her car was towed to Bangor. Murphy, who works at a nursing home as well as Denny’s, and takes classes to become a certified nursing assistant, said she was hoping to pick up extra shifts and do odd jobs to help pay the bills. One of the men joked with her about being Santa, and insisted she cash out his bill at the end of the meal, even though that was usually a duty that the hostess performed. Murphy wrote that she was stunned to find he had left her $500 tip on a $35.64 bill.